Set show/hide or sorting order of color space, etc. used on EDIUS. [Color Space] setting is reflected in the following contents. 2) Click the [Application] tree, and click [Color Space]. The [Color Space] screen appears. Display color space presets in a list. Right-clicking on an item line enables to set items displayed in [Preset List]. Pointing the mouse cursor on a preset displays the information on the preset on the tooltip. Switch the show/hide setting of presets. The names and types of presets are displayed. There are the following two types of presets. : Indicated for system preset color spaces preinstalled on EDIUS. Editing is only allowed for preset names, and the presets cannot be deleted. : Indicated for user preset color spaces added by the user. Setting a preset shows that allows editing of the preset name. A system preset color space name that has been edited has “*” in the end of the preset name. To restore its original name, click on , leave the text entry field blank, and press [Enter] on the keyboard. Import the setting file (XML format) of [Preset List]. Export [Preset List] to a setting file (XML format). Select a preset to copy, and click [Duplicate]. A new user preset color space is created with the name “Copy - Original preset name”. Select a preset to delete, and click [Delete]. 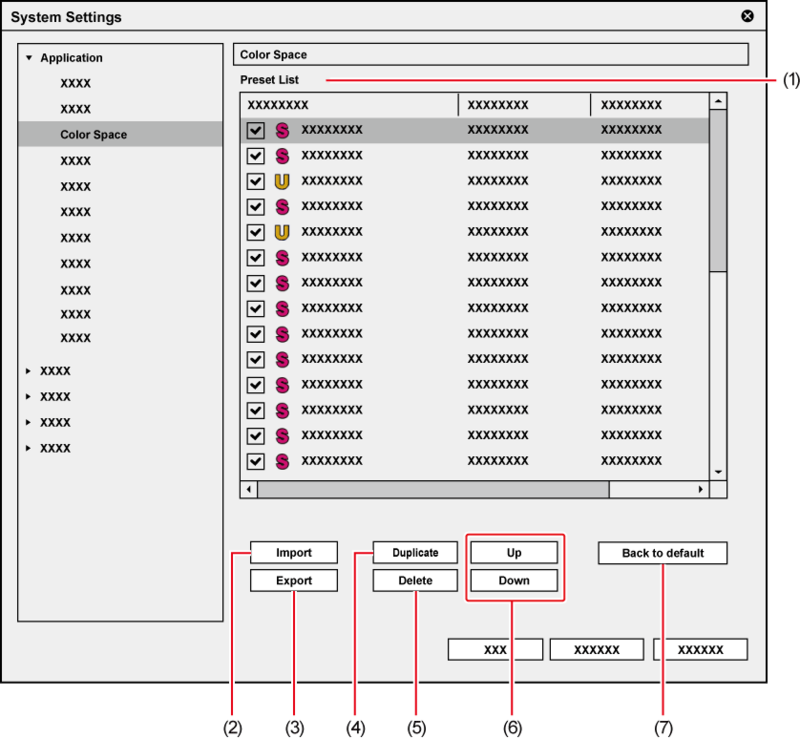 System preset color spaces cannot be deleted. Selecting a preset from [Preset List] and clicking [Up] or [Down] moves up or down the selected preset. Dragging and dropping a preset to move to a destination can also change the sort order. *1 The setting of a system preset color space can be changed by clicking . For [Matrix] and [Default Range], when an item except for [Default] is selected, “*” appears in the end of the setting value. Proxy size can be selected from three types: [Large], [Medium], and [Small]. The proxy size is 1920x1080. The proxy size is 960x540. The proxy size is 352x240. 2) Click the [Application] tree, and click [Audio Monitoring Mode]. Specify the default value by channel map when [Custom] is selected in [Audio Monitoring Mode] and monaural clip is played back. To change the clip to be played back on the Player to stereo, right-click on the track patch of the source channel and click [Audio Source Channel (Stereo)] * . Specify the default value by channel map when [Custom] is selected in [Audio Monitoring Mode] and stereo clip is played back. To change the clip to be played back on the Player to monaural, right-click on the track patch of the source channel and click [Audio Source Channel (Stereo)] * . * When [Audio Source Channel (Stereo)] is set, a check mark appears on the menu item. 2) Click the [Application] tree, and click [Playback]. Specify the size of the buffer used for realtime playback. 2) Click the [Application] tree, and click [Capture]. 2) Click the [Application] tree, and click [Render]. Set the conditions of a rendering option (load area). For example, if you check [Filters] and a rendering option is set, when a filter is applied to a clip placed on the timeline, the area of that clip changes color to orange. By unchecking [Filters], the area will not change color to orange. By default, all items below are checked. A loaded area is determined when the buffer becomes less than the set value in [Buffer Left: Fewer than] while playback. Create new project presets and manage project presets or project templates. 2) Click the [Application] tree, and click [Loudness Meter]. The [Loudness Meter] screen appears. 3) Select a loudness meter in the preset list and set each item. Click [Add] to create a new preset for the loudness meter. 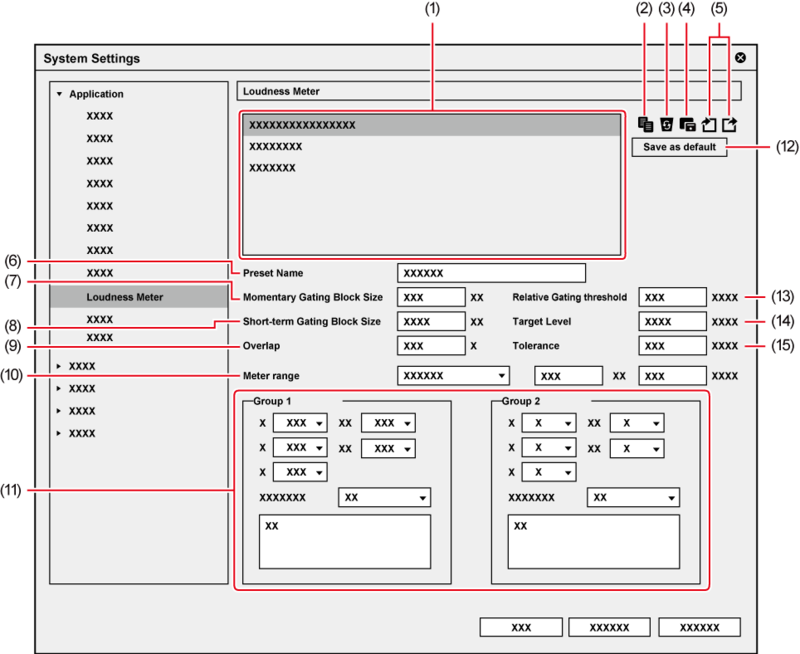 A list of presets is displayed. A “*” mark will be displayed in front of the name of the preset that is set as default, which will be used as the reference for loudness measurement and normalization. Register the preset as configured. Enter the name of the preset. Both [Group 1] and [Group 2] can be set so that measurement is performed on two lines simultaneously. Select the downmix calculation formula from the list. Select a preset in the preset list and click [Save as default] to set the selected preset as default. Set the value for the allowable tolerance. 2) Click the [Application] tree, and click [Source Browser]. Make a setting to delete the last frame when exporting a file in 720/60p or 720/50p so that the number of the frames will be even. This setting is applied to export and batch export operations. 2) Click the [Application] tree, and click [File export]. 2) Click the [Application] tree, and click [SNFS QoS].